Nan Brown and Lil Bogdan, both registered nurses, are speaker medical educators who have been featured in numerous medical and consumer publications. They have extensive experience at Johns Hopkins and other leading hospitals working with patients with burn patients and others suffering from challenging skin conditions. Using their clinical experience and knowledge of skin healing, Brown and Bogdan created a line of pure nutrient skincare sold in doctor’s offices, hospitals and spas. For over 15 years, they have lectured at hospital symposiums, women’s events, medical education meetings, and entrepreneurial events, and been featured on ABC, NBC, CBS News & PBS. Brown and Bogdan speak from experience. As long term clinicians, registered nurses, skincare experts, and business owners, they have “walked the talk” and are eager to share their message that creating true health, vitality and wellness is possible at any age. They inspire others to empower themselves with simple tools to illuminate areas in their life where they may lack what they want most—to feel and look their absolute best! 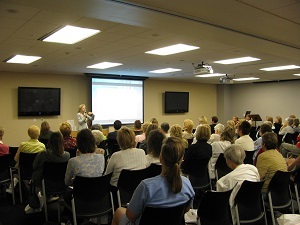 “I wanted to share with you the wonderful success of Nan and Lil’s lecture at our hospital. The presentation was flawless and the crowd simply loved them. The evaluation forms had the highest marks and many positive comments. They were a hit with all the attendees! SOUTHEAST ALABAMA MEDICAL CENTER, Dothan, Alabama. ST. LUKES HEALTH CENTER, Cedar Rapids, Iowa. GEORGIA SOUTHERN UNIVERSITY SCHOOL OF NURSING GRADUATE PROGRAM, Statesboro, Georgia. Interested in Booking Brown and Bogdan? Contact them via info@lathene.com or by phone at 843-881-7673.